The generation of turbulent inflow conditions in large-eddy simulation (LES) is a key ingredient for general applications of LES in both academic turbulent flows and industrial designs with complicated engineering flows. This is because accurate predictions of the fluid behaviour are strongly dependent on the inflow conditions, particularly in turbulent flows at high turbulent Reynolds numbers. This paper aims at improving the vortex method (VM) of Sergent that demands long adaptive distances (12 times the half channel height, for a channel flow at $Re=395$) to achieve high quality turbulence, and evaluating the equilibrium of the flow field obtained in terms of both the equilibrium of the mean flow and that of the turbulence (inter-scale turbulent energy transfer). The mean flow equilibrium is checked with classic criteria such as the friction velocity. In order to assess the equilibrium of turbulence, we propose using the velocity-derivative skewness, because it associates with the balance of energy transfer between large- and small-scale fluid motions. 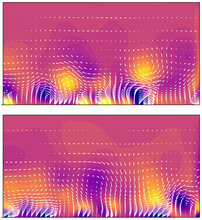 Numerical tests with the optimised set of model parameters reveal that the IVM is very efficient, in terms of adaptive distance, in generating high-quality synthetic turbulent fluctuations over a moderate distance : 6h for channel flow and $21\,\delta$ for flat-plate boundary layer, with $h$ and $\delta$ being respectively the half channel height and the nominal boundary layer thickness.